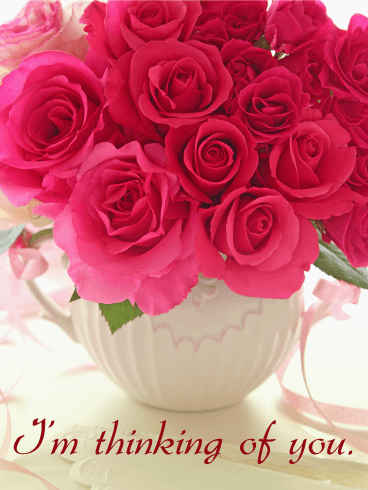 Flowers are a great way to send love and well wishes! 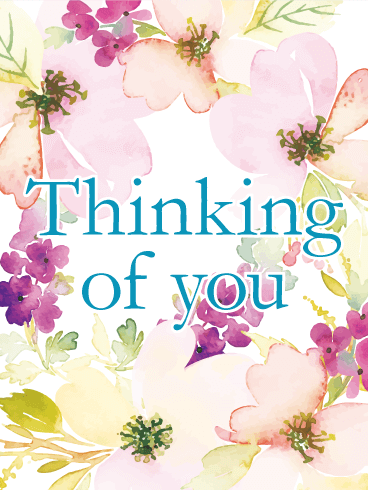 This flowery Thinking of You card offers the perfect way to let your friends and family know that they are on your mind. 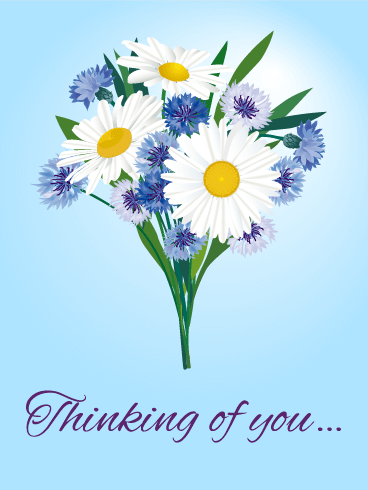 The blue "Thinking of you" message is written on top of a group of pretty watercolor flowers on a white background. The flowers are purple, pink, and peach and their leaves are in several shades of green. Send it today! Did you know that pink tulips are used to send love and good wishes? Send your love to the important people in your life with this cute tulip Thinking of You card! The background is light blue with pink, white, and green swirls and splashes of white, yellow, and green. Six pink tulips sway on their green stems underneath a pink "I was thinking of you today." message. Send it today! Do you have a friend, coworker, or family member who loves dogs? Send them this Thinking of You card! 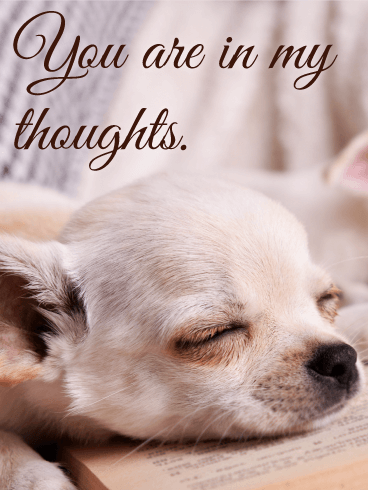 This card shows a sweet Chihuahua as it sleeps on an open book, waiting for its owner and friend to return. Black fancy cursive font says, "You are in my thoughts." This card is the perfect message to send to the loved ones on your mind. Are you missing a friend or family member who is too far to visit? 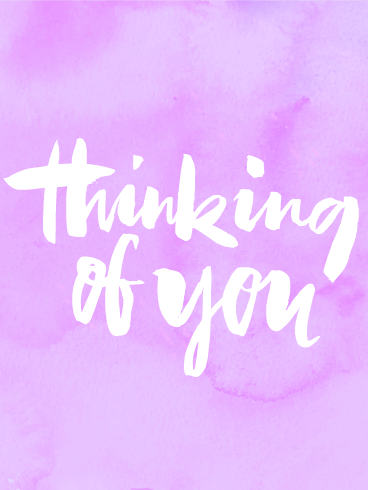 Send them a Thinking of You card! This card is perfect for anyone you know who loves cats and kittens. 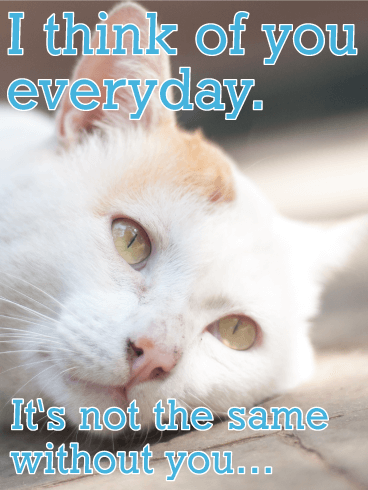 It features a white and orange cat as it lays in the sun, missing its best friend. It reads, "I think of you every day. It's not the same without you." Send this card to the person you miss most! Do you know someone who puts a smile on your face? Let them know with this bright and fun Thinking of You card! The background is a light blue with spots and sparks of light shining around the large yellow smiley face in the center. Yellow text says, "Just thinking of you makes me smile!" 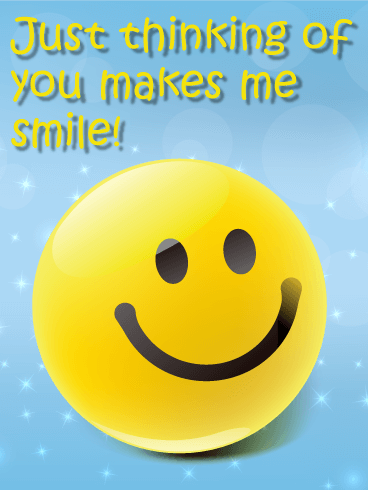 Make someone else smile today by sending this card! 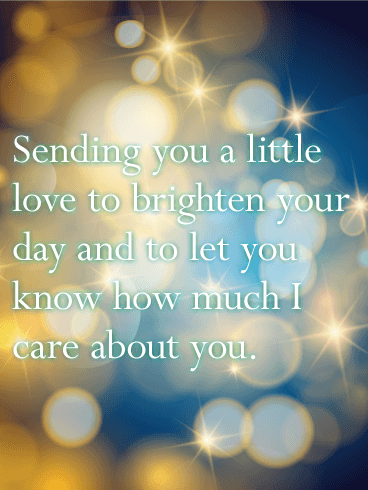 If someone you know is feeling down or going through a rough time, send them this Thinking of You card to let them know you care. This card has a blue background, covered with spots and stars of bright light. The message says "Sending you a little love to brighten your day and to let you know how much I care about you." Send this card to show your love today! Is there someone on your mind today? Do you find yourself missing friends and family? 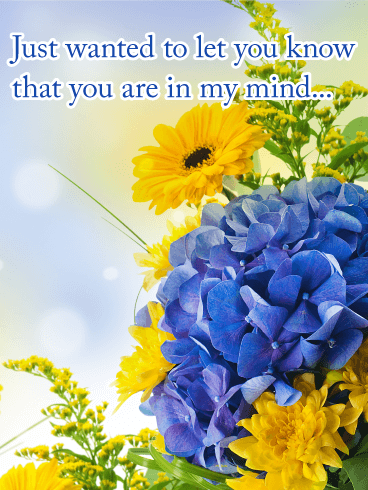 If so, let them know they are on your mind with this Thinking of You card. The background is a beautiful and artsy purple tie-dye design with a handwritten "thinking of you" sentiment in the center. Show how much you love and care with this great card! Is there someone on your mind who loves cats and cartoons? Do you someone who needs some cheering up? Then send them this Cat Piñata Thinking of You card! A pink, green, orange, yellow, and white Cat Piñata is featured at the top and enclosed in a heart. The rest of the card is light pink, with hearts, spots, and sparks of lights. "Now, I am thinking of you." is written in sea green.